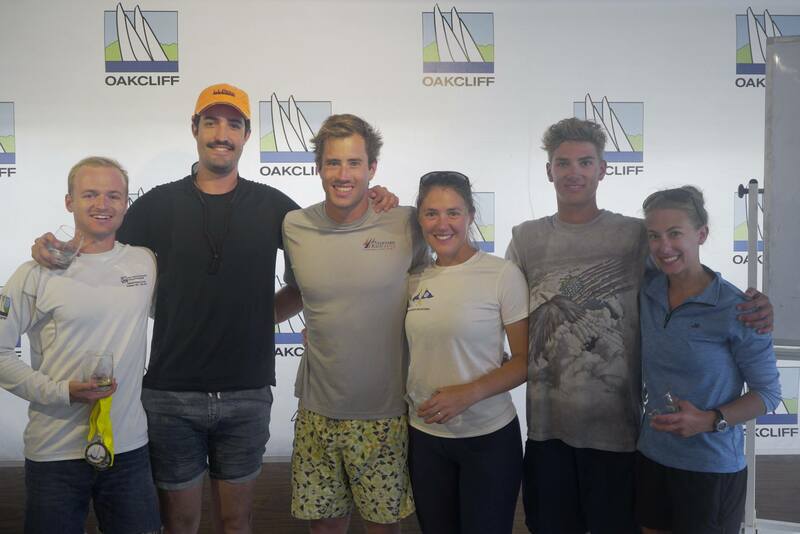 OYSTER BAY, NEW YORK (July 22, 2018) – Skipper Bryce Kopp, who did pit for Pearson Potts during his winning run at last year’s US Match Racing Championship, found victory at Oakcliff’s July Grade 4 Clinegatta with coaching by Dave Perry. His crew consisted of Tim Clark (main), Can Nash (float), and Sarah Stephan (trim), Jill Fattibene (tactics), and Bryan Stephan (bow). In second place was Derek Webster and in third was round robin leader Patrick Shanahan who had an eight-race winning streak on day one. Three of the nine teams who competed were skippered by women and eight teams had two or more female crew. The mix of men and women produced some high quality dynamic racing. “What I saw today looked more like Grade 3 racing than Grade 4 racing,” said Organizing Authority, Bill Simon. This weekend was also the debut of Oakcliff’s new Nordac 3Di jibs for the entire Swedish Match 40 fleet. This brand new line of sails from from North features their patented 3Di molding technology with dacron instead of carbon fiber.